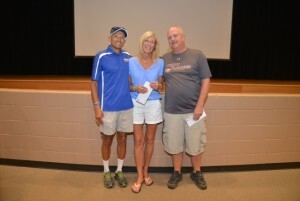 Gaithersburg High School (GHS) announced its inaugural Athletic Hall of Fame class of 22 inductees this week. 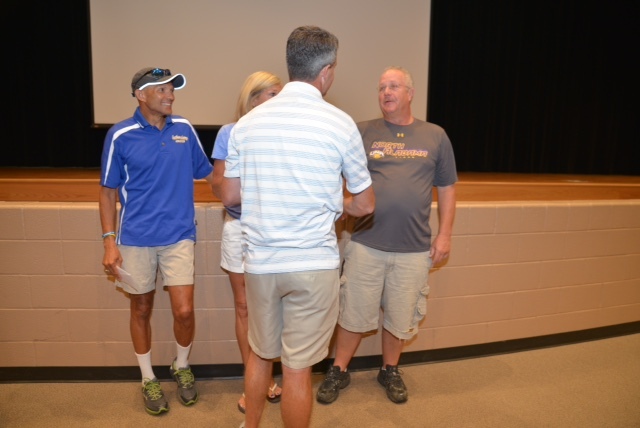 Athletic Director Jason Woodward said the Athletic Hall of Fame recognizes athletes, coaches, administrators and community members who have been nominated by and or demonstrated a high level of athletic achievement while an active member of the Gaithersburg High School community. If you are a local sports fan, you may recognize some of the names in the inaugural class. The inaugural class includes Stephanie Collins, Calvin Fitz, Tony Greene, John Harvill, Lashawn Haythe, Fred Joyce, James Joyce, Kreg Kephart, Jim LeCompt, Joe Mencarini, Fran Parry, Dotti Rowe, Michele Staymates, Bill “Elbows” Simpson, Clarence Thomas, Herb Tolbert, Elsworth “Tookie” Turner, Jim Ward, Lisa Winter, Tim Woodward, Steve Yachmetz and Steve Young. Woodward introduced and welcomed three of the Athletic Hall of Fame inductees, Herb Tolbert, Michele Staymates and Kreg Kephart, at a teachers meeting on Monday morning at GHS. He read a letter that is being sent to each of the inductees and shared some facts about the three coaches in the building that day. Tolbert is a legend at the school. He coached cross country and track and field for 43 years at Gaithersburg High. He also coached girls basketball in the early 1980’s winning a region title as well. 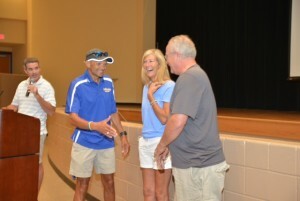 He coached the first female high school cross country runner in the county in 1972 and 1973 before it became a varsity sport. 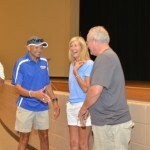 Tolbert won a boys state cross country title in 2000 and has won 12 division titles, eight region titles and six county titles. 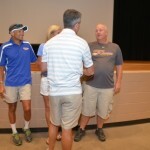 He was named the coach of the decade in 2010 by MoCo Running. Tolbert carried the Olympic torch through Washington, D.C. for the 1996 Atlanta games. Since 1989, Staymates has coached volleyball at Gaithersburg High. During her 27 years, she has a career record of 278-86. Under her guidance, the volleyball team has won nine division titles, five region titles, and in 2005 she coached GHS to its first state volleyball title in school history. She also coaches the coed volleyball team in the spring. Kephart was an all met linebacker in 1972 and helped the team to an undefeated season. He was the assistant coach from 1983-1999 and has been the team’s head coach since 2000. He has won a state title and division championships and has helped over 80 players go on and play football in college. Kephart was named to the DePauw University Hall of Fame in 2010. 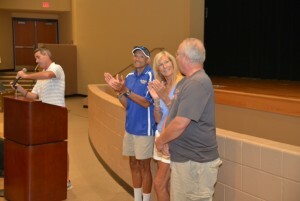 The coaches were caught by surprise at the announcement. The first person she called to tell about her Hall of Fame honor was her 90-year-old father who lives in Hagerstown. He was so happy, she said, there were tears. 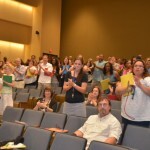 “I couldn’t be feel more blessed and fortunate and honored,” Staymates added. The 22 inductees will be formally inducted at 1 p.m. on Oct. 10, which is the school’s homecoming weekend. The Athletic Hall of Fame will be located inside the building in the main athletic hall.